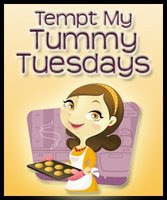 Today is Tuesday - I am here to Tempt Your Tummy! I have been trying to do recipes on Tuesdays (got the idea from my SIL Kari, from this blog, http://blessedwithgrace.blogspot.com) I think I missed a few Tuesdays... anyways... we didn't carve our pumpkin this year, just left it plain - that meant that I still had seeds in there :) I have never tried or really heard of eating pumpkin seeds but a coworker of mine brought some in last week and they were yummy. I then saw this recipe on this blog, http://castsugar.blogspot.com and decided to try it... Here are a few pictures and let me tell you they are yummy! Preheat oven to 250 F. Line a baking sheet with parchment paper. Cut pumpkin open from the bottom, removing seeds with a long-handled spoon. Separate flesh from seeds, and reserve the flesh for another use (that over-achiever Martha would like for you to save it to make pie filling). Pumpkin should yield 1 cup seeds. Spread seeds on parchment in an even layer. Bake until dry, stirring occasionally, about 1 hour. Let cool.